1) You’re single because you are not good enough. These kinds of thoughts can leave us feeling very low and even condemned. Thoughts along the lines of: ‘you’re not a ‘good Christian’’ or ‘you’re so weak in your faith, no Christian brother can appreciate you.’ Firstly we all go through difficult periods and seasons, and may fall short in our prayer life. The thing you have to realise is the Spirit of the Lord DOES NOT CONDEMN!! The Holy Spirit encourages us. If we are going through areas of dryness in our spiritual life, the Holy Spirit will not leave us feeling weak but rather strengthened with words such as ‘You can do all things through Christ who strengthens you (Philippians 4:13), don’t give up on prayer.’ And to be honest most of the time we can also be so hard on ourselves, and just end up believing the lies and accusations of Satan (Revelations 12:10). Remember Christ came not to condemn the world but to SAVE the world (John 12:47). We just have to exercise patience and wait for Gods timing. 2) You’re single because you’re a boring person. Oh man this lie of the enemy REALLY frustrates me KMT! It makes us feel like the God given hobbies and interests we have are worthless (obviously here I am talking of non-sinful practises which bring glory to God). When God created Adam and Eve He found beauty in them, they were good and were made in His likeness. Therefore who is Satan to say that you’re boring because you’d rather stay at home to bake or nap rather than go to a house party? Don’t let Satan rob you of what you are created to do, simply because he wants you to believe that you need to take interest in what you think ‘most guys’ take interest in, just so you have a higher chance in getting married quicker. There’s nothing wrong with not liking the colour pink, or being a girl who plays drums, or not liking your hair long, or not liking to wear skirts. Isn’t it better to feel loved for who you truly are? Remember the devil goes round like a roaring lion looking to kill, STEAL and to destroy (John 10:10). Don’t let him steal your talent. When you argue against Gods will for your life (Ecclesiastes 6:10), by trying to carry out interests you were not created for, you end up living an unfulfilled life. 3) You’re single because you don’t look good enough. First of all let us just completely obliterate that lie of the devil with scripture. ‘You are fearfully and wonderfully made in the image of God (Psalm 139:14). So Satan can just stop right there. Ladies I know exactly how hard it is to try to keep up with the so called ‘feminine ideal’ us ladies are supposed to keep up with. I for one do not have the time to apply make up on before I go to work, and frankly I don’t see the need to, especially for my line of work. That’s just how I am, I am not here to force women to not wear make- up, there is absolutely nothing wrong with make-up in itself. The first thing I do when I get up is pray and read my bible, the next thing lined up on the list of things for me to do, is to shower and EAT (Food over make-up). I can’t lie I do tend to put on mascara for work and apply a lot of lip balm (you know how this dry weather can just affect ones lips lol). But any who, never feel that you have to change the way you look, or start dressing a certain way before you can get a husband. I mean if you have become more modesty in your dressing because the Spirit has encouraged you to do so, that is a totally different story. Don’t feel pressured to dress a ‘certain way ‘ because you want to please a ‘certain man’. If the guy you are interested in is only concerned with your outer appearance, there’s a very strong possibility that maybe they are not the one for you. I would never encourage anyone to change their God given physical appearance, because you need to learn to love yourself and see what God sees in you. If you feel low and depressed about how you look, I’d encourage you to pray to your heavenly Father, and also tell another sister in Christ who could also encourage you and join you in prayer. Finally I would just like you to remember that there is a man who loves you regardless of your annoying habits, strange quirks and how you look and smell when you get up in the morning. He loves you even though He knew that you would turn your back on Him. There is absolutely NOTHING you can do to make Him love you less, isn’t that just so AMAZING. And that man’s name is Jesus and He is GOD!! 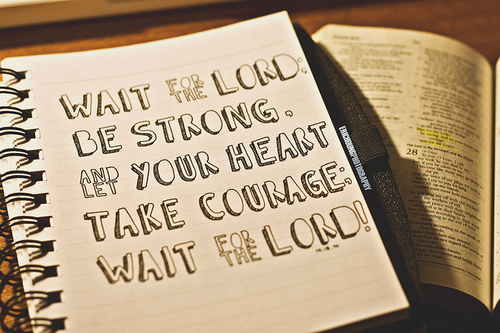 So I urge you not to worry, but just to wait patiently for His timing. You’re not going to have to have to marry that fresh uncle that’s old enough to be your dad, because you feel he’s the only guy left for you. If God has promised you that He will bless you with a husband He will, because He is not a man that He should lie (Numbers 23:19). He’s preparing your husband for you and He will bless you FAR BEYOND what your mind can imagine (Ephesians 3:20). It is also very important that you do not idolize marriage, in your time of singleness direct your focus onto the things of God.